Madison city officials' 2001 decision to replace all lead water service lines was met with skepticism and debate over how private property owners would pay for their portion of the project. The crisis in Flint has people around the nation concerned about lead in drinking water. The small city in Michigan, where the majority of residents are black and many are poor, has become a symbol of environmental racism. In Flint, the lead came from water pipes that were corroded by polluted water. In Chicago, the concern stems from some 400,000 lead water service lines. That is more lead water lines than any other U.S. municipality, according to city officials. Eighty percent of Chicago’s properties have a lead pipe leading from the iron water mains that run under the streets straight into homes. While Chicago officials say they are complying with federal health regulations and the city’s water is safe, a class-action lawsuit filed earlier this year seeks to force the city to replace its lead water service lines. As Chicago rips up water mains across the city to upgrade its aging infrastructure, experts say the chance of lead seeping into water increases. Because they tend to live in older housing stock with older water lines and plumbing, low-income people of color are at highest risk of lead contamination, which causes lowered IQ’s and learning disabilities. The possibility of lead seeping into a home’s tap water will always be a risk unless the lead pipes and plumbing components are replaced entirely. But replacing the city’s water lines is an expensive and complicated proposition. Property owners would have to share the cost because each pipe is jointly owned by them and the city. Long before Flint prompted national fear of lead-contaminated water, Madison, Wis., replaced its lead water service lines, which were outlawed by the federal government in 1986. Chicago could learn from the city’s experience. Madison began replacing all of its lead service lines in 2001 and over 11 years completed the removal of all 8,000 known lead pipes in the city. But at the outset of the project there was skepticism in the media about whether the city’s pipes actually posed a threat. “The dangers associated with lead poisoning from pipes are so remote and so far down the list of public health risks that spending $20 million in private and public money for this purpose seems irresponsible,” declared the Wisconsin State Journal’s editorial board in 1999. Chemical engineer Abigail Cantor argued that the dangers were real. She was a consultant assigned to help the Madison Water Utility comply with the federal government’s Lead and Copper Rule. Created by the EPA in 1991, the rule requires public water systems to control lead and copper in water and monitor corrosion of their pipes. Cantor was hired to test the effect of various chemical water treatments. Ultimately, none of them were viable for Madison. The water utility agreed that the pipes needed to be replaced, but in the months that followed, city leaders debated how to pay for the project, particularly the portion that would be billed to private property owners. Robin Piper, who at the time worked at the water utility’s finance department and is now the chief administrative officer of the city agency, said the first plan was to raise rates for all utility customers. But since only a minority of the customers had lead pipes, Madison’s Public Service Commission struck down this idea. “It would set a bad precedent in their mind that we were providing a benefit to the property owners that wasn’t available to the rest of our customers,” Piper explained. In the end, an unexpected solution presented itself: Since the mid-1990s, cellular service providers like AT&T had been leasing space for their antennas on the water utility’s tanks and towers. The rents—about $400,000 per year— were kept in a fund that had added up to $4 million by the early 2000s. “We were surprised when we found out that there was that much,” said Piper. The water utility used the money to compensate customers for half the cost of replacing their end of the pipe, capping the subsidy at $1,000 per property. Then, the City Council passed an ordinance requiring homeowners to replace their lead service lines. On average, replacing pipes cost homeowners $1350 each, of which an average of $675 was reimbursed. The project cost the city some $15 million total. Looking back, Sue Bauman, who was mayor of Madison between 1997 and 2003, does not recall much public disagreement about replacing the pipes, just the debate about how to pay for it. The city’s plumbing contractors also offered discounts to property owners who decided to get rid of their ends of the service lines at the same time as the water utility worked on its ends in a neighborhood. “It all went pretty smoothly,” she said. If the average cost of replacing a lead pipe in Chicago were comparable to Madison’s, the city could be looking at a $750 million bill for a similar replacement project on its end alone. However, local plumbers have estimated that replacing lead pipes could be as high as $20,000 for some properties. “I’m glad I’m not facing that issue, I can’t imagine being mayor of Chicago,” Bauman said. The City of Chicago tests 50 homes for lead in drinking water every three years; most are in communities where the risk of lead contamination is low, according to the Chicago Tribune. In April, the Chicago Department of Public Health announced that it would be testing tap water for lead where child lead poisoning cases had occurred, as well as in some schools. However, this approach does nothing to prevent lead poisoning in the first place. The city’s water is treated with orthophosphates, chemicals that over time create a protective deposit coating inside the lead pipes. However, any disruption to the ground or water mains in the area (through construction, for example) can cause the pipes to lose this coating, allowing lead to leach directly into drinking water. Since the city is in the midst of a 10-year plan to replace 900 of its 4,000 miles of water mains, lead service lines, which carry water from the mains into people’s homes, are being disturbed in many neighborhoods. Lead water pipes were recognized as a cause of lead poisoning by the late 1800s, and by the 1920s, some cities were restricting their use. But lobbying by the lead industry effectively countered critics and extended the life of lead, despite evidence of the public health hazard. Lead water pipes weren’t outlawed until decades later. 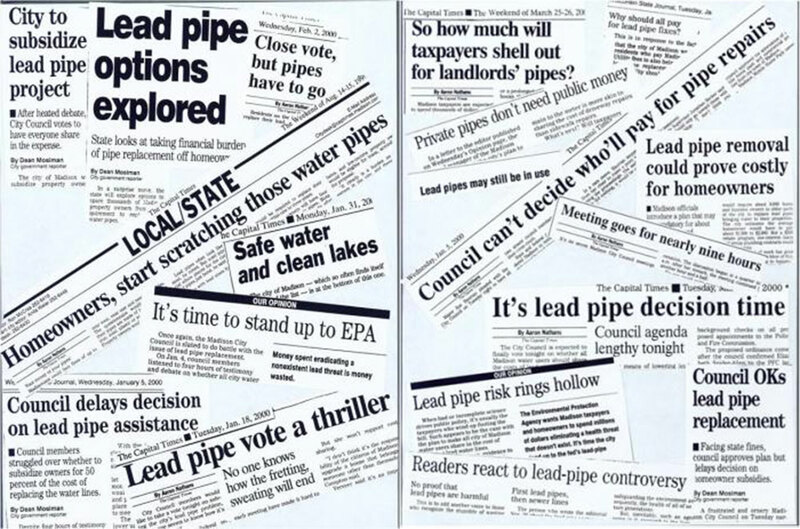 Chicago actually required the use of lead pipes to connect homes to city water until 1986, when the federal ban was enacted. The Department of Water Management assures citizens that Chicago’s drinking water meets federal requirements for lead concentration, but in 2013, Miguel Del Toral, an EPA worker who later helped expose the crisis in Flint, published a study that paints a starkly different picture. The city is in compliance based on the EPA’s testing protocol – checking the first liter of water that comes out of the tap in the morning for lead particles. In most cases, however, the protocol fails to reveal the peak concentration of lead in the water, Del Toral explained. He and his team found that sometimes peak lead content did not appear until the tap had run for several minutes. Though lead particles can be sifted out of water with store-bought filters, the only permanent solution to the public health hazard is replacing all the lead water pipes in the city, Del Toral said during a recent talk with residents in Chicago’s Pilsen neighborhood. Cantor conducted new tests in Madison in the years after pipe replacement and found that some homes continued to have lead in the tap water. This is because lead particles build up in scale deposits inside water mains. And, even when both the mains and service lines are replaced, the scales can continue to linger in a home’s plumbing and take years to flush completely. Cities of every size have the same three risk factors that cause lead to show up in the drinking water, she explained: lead pipes and plumbing parts; chemical and biological build up in water systems that capture lead particles; and the biological instability of the water, which can cause corrosion and lead release like it did in Flint. The prospect of proactively replacing lead water lines entirely, instead of continuing the strategy of monitoring and treating water to prevent corrosion, is gaining some traction nationally. Senate Democrats have introduced legislation that would inject billions in federal funding into water infrastructure and lead relief programs, including a tax credit for homeowners to remove lead. The EPA is also considering changes to the Safe Drinking Water Act’s lead rules to encourage public water systems to replace lead pipes. Longtime Ald. Patrick O’Connor, forced into a runoff for the first time, faces progressive challenger Andre Vasquez – and his record as a mayoral loyalist may not help him. Racist emails, patronage, questionable TIF spending, school funding shortfalls, violence and youth joblessness signal how the mayor is failing to move the city forward. Little Village parents worried about the air pollution and chemicals deposited in soil at the former industrial site. Now children can safely play in La Villita, a park that was created after the property was cleaned up.